A couple of weeks ago I decided that it was past time that I headed for a high country stillwater. 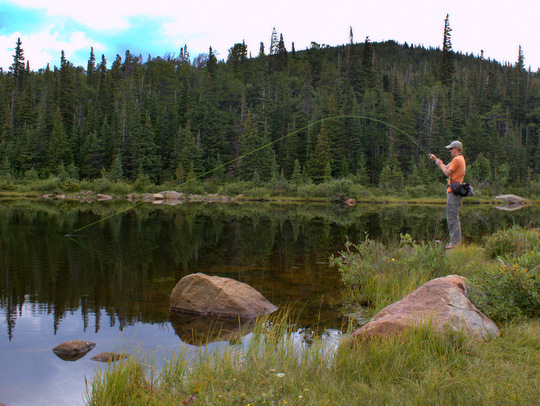 The sheer volume of great places to fish means that some get overlooked. Having fished rivers and streams all summer, I wanted to try something different. Deciding where to fish was difficult since I have numerous lakes to choose from within about an hour of where I live. Just in Rocky Mountain NP alone there are enough options to keep me busy for several years. 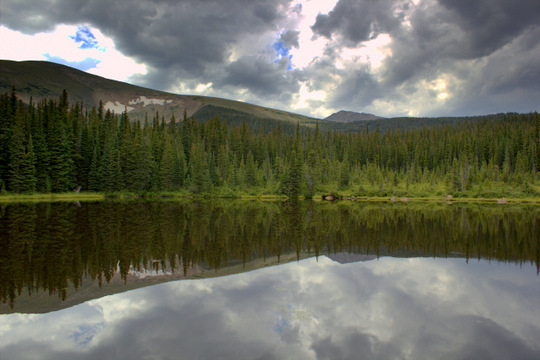 A bit closer, the Indian Peaks Wilderness also offers many choices and that is where I decided to go. The particular area actually had a few lakes somewhat close to each other allowing me to hit more than one if the fishing turned out to be poor in my first choice. At the lake, caddis where periodically landing on the surface and then skittering around for anywhere from a couple of seconds to maybe half a minute before disappearing in large boils. Some of the takes were downright violent and with building excitement I rigged up with a #14 Elk Hair Caddis in black. Maneuvering carefully around the lake while avoiding the low wet spots, I was finally in position. 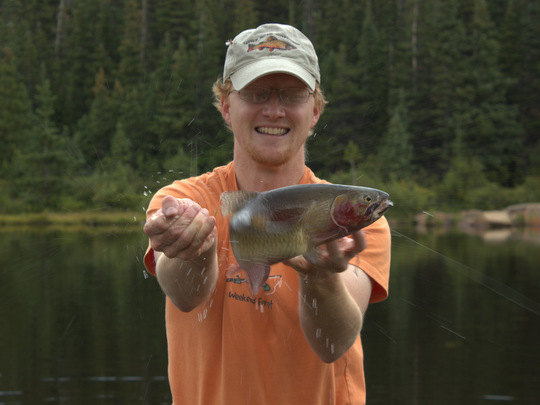 On the second cast, a small cutthroat of perhaps 11 inches torpedoed out of the stained water to hammer the fly. I promptly ripped it out of its mouth. Bummer. The next several minutes quickly showed me that the fish were spooky. The rises soon ended, and I wondered if I had just blown my only shot at a fish. The scenery was great though, so nice in fact that I started looking around to take it all in. I'm sure you all can guess what happens next. I have a theory that fish have sentinels designated to spy on fishermen and whenever our attention is distracted the fish will spread the word that it is time to feed. I heard the take rather than saw it. After getting too excited on the first fish that was probably a good thing. I reared back on the fly rod. 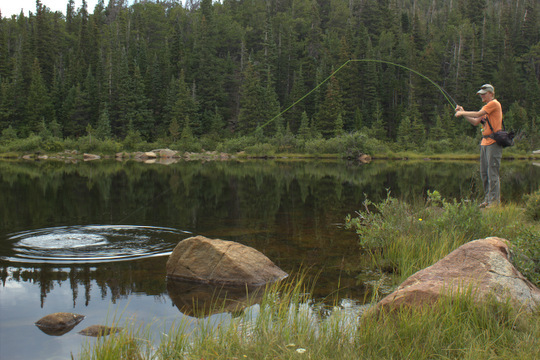 The full-flex 4 weight (say that 10 times fast) bent to a heavy cutthroat and the battle was on. Using every trick it knew, the fish took more and more line until I was seriously contemplating whether I would be able to land it. Thankfully, the fly rod's soft tip protected the 5x tippet just fine, and slowly I regained control. The fish made several powerful runs, something I'm not really used to seeing from cutthroat. More often they just roll over and give up. Finally, I got it close enough to see it clearly the next time it rolled, and I got excited. It was really colorful, looking almost like a giant goldfish swimming around out in the lake. Not wanting to beach such a magnificent fish on a dry bank, I jumped in (I was wearing sandals) to land the trout. A quick picture was captured before it gave a mighty thrash. The look on my face in the second picture says it all. It snapped the line on its way down and was gone. I hated leaving a fly in the fishes mouth. Next time I'm carrying my big net, even if it is a long hike. I'm developing a collection of awesome fish "escape" photos. One of these days I'll share a post of "Escapes Over the Years." Until then, rest assured, this fish fell straight into the water (which was really cold by the way) and other than some new jewelry escaped unscathed. 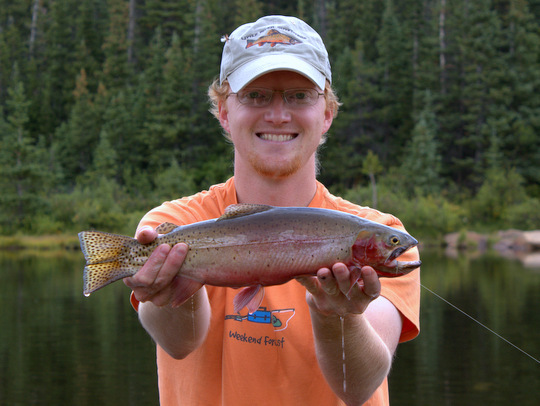 If you happen to catch a nice cutthroat in a high country lake that has a Black EHC, let me know! That is one very nice Cutt. Well done David. Beautiful trout sir. I too have a nice collection of escape pics, has to make you laugh. Pretty cool series of photos David. Beautiful cutty!